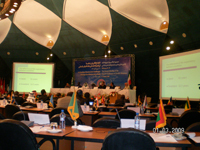 The 2nd Session of the Islamic Conference of Health Ministers (ICHM) was held on 1 - 4 March 2009 in Tehran, the Islamic Republic of Iran, under the patronage of H.E. Dr. Mahmoud Ahmadi Nejad, President of the Islamic Republic of Iran and hosted by the Ministry of Health and Medical Education. Forty-five OIC Member States were present and twenty-two of the delegations were led by their respective Ministers of Health. The OIC General Secretariat and the related OIC institutions such as SESRIC, COMSTECH, IDB, ISESCO and health related international organisations such as WHO, UNICEF, UNAID, UNFPA, and the Global Fund were represented in the Conference. to look into ways and means of effective follow up mechanisms in the implementation of the decisions and recommendations made by the Ministers. Emergency preparedness and response: common Islamic approach. The Tehran Declaration adopted at the 2nd ICHM stresses on equity in health meaning people having access to the resources, capacities and capabilities they need to act upon the circumstances of their lives. Likewise, observance of principles of integrity, transparency, accountability and inclusion is of significant importance in realization of health equity and recognizes that international cooperation in health is not an option, but a must, since in the increasingly interconnected world, communicable diseases can spread much faster than in the past and the threat of newly emerging diseases is growing. Therefore, unimpeded access to health technologies, vaccines, materials and knowledge at the international level is an integral part of the health equity. In this regard, Tehran Declaration calls for expeditious implementation of health-related part of the OIC 10-Year Program of Action (TYPOA) to draw up a program for combating diseases and epidemics. The Conference welcomed the recent SESRIC initiative on Health Capacity Building Programme which aims at enhancing cooperation between the relevant health authorities in OIC Member States, and encouraged SESRIC in collaboration with IDB to conduct full-fledged surveys in order to identify the needs and capacities of Member States, and organise short training programmes. Furthermore, the Conference invited SESRIC to collaborate and coordinate with WHO and participate in WSIS follow-up activities in the area of ICT applications, to conduct e-health assessments in the Member States, to share best practices in this areas. The Conference also invited OIC Member States to cooperate with SESRIC to strengthen their national database to consolidate disaggregated data related to health inequalities and their related social determinants. The Conference urged the OIC Member States to consider being self - reliant and self - sufficient in their immunization programs, inter alia, by ensuring the production of good quality, safe, effective and affordable vaccines and investment in advanced bio-technology to develop good quality and effective vaccines. It called upon the international organizations such as the WHO and UNICEF to assist the OIC Member States to expand their national immunization programmes to reach all unvaccinated children and requested the OIC, WHO and other relevant international organizations to cooperate to foster health capacity building programmes in the OIC Member States to promote health equity. The Conference also recognized the role of media, educational centres, religious leaders and institutions and the civil society in raising awareness about different aspects of health. The Conference expressed its deep concern on the deteriorating health and environmental degradation in the Palestinian territory, in particular in Gaza Strip and in the Syrian Occupied Golan due to the Israeli occupation. Referring to the Fourth Geneva Convention of 1949, the Conference condemned strongly the Occupying Forces for the grave violations of Palestinians rights to health, particularly, their arrests, collective punishments, blockade and access to clean water, electricity, medication, food and vaccines delivery to cities, towns and refugee camps, the obstruction and prevention of movement of health staff and ambulances from transporting the injured to hospitals and the inability of patients specially pregnant women to access health centres and facilities. The Conference urged all the OIC Member States and international organizations including WHO to provide and mobilize adequate resources and support to protect public health and strengthen the healthcare delivery system in Palestine in general and Gaza in particular, Syrian Occupied Golan and other conflict affected areas. The Conference has also endorsed the Terms of Reference of a Steering Committee and requested the Steering Committee to continue monitoring implementation of the decisions and recommendations of the ICHM. The Conference also mandated the Steering Committee, in collaboration with Member States, to develop a draft of a Strategic and Health Programme of Action of the OIC Member States for 2012 - 2022 for its submission and adoption at the Third Session of the ICHM.